The second semester Step 2 Study & Life Skills starts with this course, for students ages 7-8, or for students of any age who are developing literacy. This course covers food and diet, exercise, sleep, cleanliness — the things a person should be aware of and know about to keep themselves healthy and well. 19 lessons and one test, a full ten week of study that will help change a student's life and put him in charge of his own body and its needs. 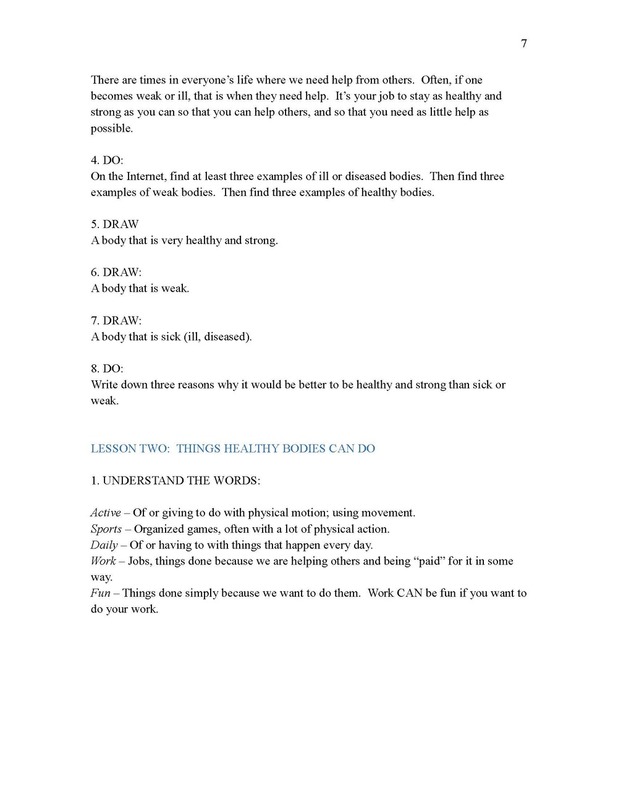 Followed by Step 2 Study & Life Skills 4, which explains more about wellness and diseases, so the student can understand and have some control over his own health, and even help with the care of others. Study & Life Skills courses do not need to be done in order, and if a student ages 7-8 needs to understand the body, illness and wellness NOW, then Study & Life Skills 3 and 4 are excellent choices, a full semester of work between them. This course provides the student a good, basic understanding of day-to-day health, and what one needs to have and do in order to be as healthy as they can. Things that a healthy body can do. Things that unhealthy bodies cannot do. Food and its effect on the body. Water and its importance to the body. What polluted water does to the body. How we get our food. Carbohydrates and their value as food. Fats in food and their importance and liabilities. Vitamins and Minerals and their value to the body. Vegetarianism - pros and cons, and types of vegetarians. Breathing, clean air and its importance to the body. Cleanliness and its value to health.